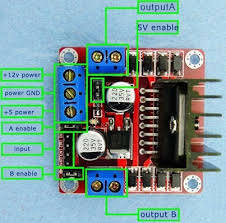 how to control speed of dc motor connected to pi & l298n ? Feels robo is too fast and getting out of control to sense line ..
Last edited by chetuk on Mon Feb 19, 2018 6:24 am, edited 2 times in total. Re: how to control speed of dc motor connected to pi & l298n ? this is my code the robo run too fast ...please help to add code so to slower down speed as i desire/??? google "raspbery pi pwm duty cycle"
Any suggestion in code i tried search in google but confused . this is an example of PWM controlling a fan speed but it will work exactly the same for your motor speed control. and [/code] at the bottom. Dear Chetuk sir, could you please send me your demo code, I have tried all the processes available on the internet for using PWM signal to control the speed of the motor, but none of this is worked. I will be really grateful if you kindly give me your demo code, just to control the speed through PWM using a raspberry pi. Just give me a reply, I'll give you my email id. It might help if you show us your code and tell us how you tried to enable speed control , on most L298N motor controllers you only have to apply a PWM signal to the ENA & ENB pins on the motor control board to get speed control. on this example the pins are marked " A enable " & " B enable " you would need to remove the existing jumpers if fitted as on this example board. If you apply PWM to enable pin you get the motor run-coast-run-coast-run-coast. Be also aware that L298 is only good for motors with running current less than lets say 1A. Its big energy waster and tends to overheat and shut down.